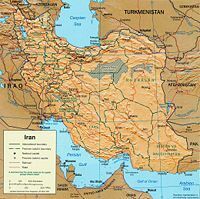 Iran, officially the Islamic Republic of Iran (جمهوری اسلامی ايران) is an Islamic theocratic republic in southwest Asia. Its capital is Tehran and its official language is Farsi. A historical name for Iran was "Persia, " which is also the name of the dominant ethnic group. Iran is suspected by Israel and her western allies of pursuing nuclear weapons to gain a strategic advantage in a regional cold war against Sunni-majority Saudi Arabia. Israel also accuses Iran of pursuing nuclear weapons for use against Israel, which is hotly denied by Iran's government which claims the program is to be used for peaceful purposes, requiring the enrichment of uranium. Iran is not a pluralistic society, but does have little diversity. Persians are the largest predominant ethnic and cultural group in this country, though many are actually of mixed ancestry. The population of the country has important Turkic elements (e.g., Azeris) and Arabs predominate in the southwest. In addition, Iranian citizens include Kurds, Balochi, Bakhtyari, Lurs, and other smaller minorities, such as Armenians, Assyrians, Jews, and Brahuis (or Brohi). Population growth rate (2007 est. ): 0.663%. Ethnic groups: Persians 51%, Azeri 24%, Gilaki and Mazandarani 8%, Kurd 7%, Arab 3%, Lur 2%, Baloch 2%, Turkmen 2%, other 1%. Religions: Shi'a Muslim 89%; Sunni Muslim 9%; Zoroastrian, Jewish, Christian, and Baha'i 2%. Languages: Persian and Persian dialects 58%, Turkic languages (besides Turkish) 26%, Kurdish 9%, Luri 2%, Balochi 1%, Arabic 1%, Turkish 1%, other 2%. Education: Literacy (total population age 15 and over who can read and write, 2003)--79% (male: 86%, female: 73%). Health (2007 est. ): Infant mortality rate—38.2 deaths/1,000 live births. Life expectancy at birth (2007)--total population: 70.56 yrs. The 1979 Islamic revolution and the 1980-88 war with Iraq transformed Iran's class structure politically, socially, and economically. During this period, Shia clerics took a more dominant position in politics and nearly all aspects of Iranian life, both urban and rural. After the fall of the Pahlavi regime in 1979, much of the urban upper class of prominent merchants, industrialists, and professionals, favored by the former monarch, the shah, lost standing and influence to the senior clergy and their supporters. Bazaar merchants, who were allied with the clergy against the Pahlavi shahs, also have gained political and economic power since the revolution. The urban working class has enjoyed somewhat enhanced status and economic mobility, spurred in part by opportunities provided by revolutionary organizations and the government bureaucracy. Though the number of clergy holding senior positions in the parliament and elsewhere in government has declined since the 1979 revolution, Iran has nevertheless witnessed the rise of a post-revolutionary elite among lay people who are strongly committed to the preservation of the Islamic Republic. Most Iranians are Muslims; 89% belong to the Shi'a branch of Islam, the official state religion, and about 9% belong to the Sunni branch, which predominates in neighboring Muslim countries. Non-Muslim minorities include Zoroastrians, Jews, Baha'is, and Christians. The Supreme Leader holds power for life unless removed by the Assembly of Experts. He has final say on all domestic, foreign, and security policies for Iran, though he establishes and supervises those policies in consultation with the Expediency Council. The Leader is the final arbiter on all differences or disputes among the various branches of government. He appoints officials to key positions including the head of judiciary and the 12 members of the Guardian Council (six directly, six indirectly). He has power to remove the president and is commander-in-chief of the armed forces. The constitution stipulates that the Assembly of Experts, which currently consists of the 86 popularly-elected clerics elected to 8-year terms, chooses the Supreme Leader based on jurisprudent qualifications and commitment to the principles of the revolution. The Assembly of Experts reviews his performance periodically and has the power to depose and replace him. Pragmatic conservative candidates generally polled better than their hardline conservative opponents during the December 15, 2006 elections to the Assembly of Experts. (Turnout for this vote, which coincided with municipal council elections, was quite high, topping 60%.) Citizens will not vote for representatives to the Assembly again until 2014. The Council of Guardians consists of 12 persons. The Supreme Leader appoints the six religious members of the Council of Guardians while the Iranian parliament, the Majles, selects the six lay members from candidates recommended by the judiciary, which is in turn selected by the Supreme Leader. The non-clerics play a role only in determining whether legislation before the Majles conforms to Iran's constitution. The religious members, on the other hand, take part in all deliberations, considering all bills for conformity to Islamic principles. The Council of Guardians can veto any law. This body also certifies the competence of candidates for the presidency, the Assembly of Experts, and the Majles. The president of the Islamic Republic of Iran is elected by universal suffrage to a 4-year term. The president supervises the affairs of the executive branch, appointing and supervising the Council of Ministers (members of the cabinet), coordinating government decisions, and selecting government policies to be placed before the National Assembly. The Majles, or National Assembly, consists of 290 members elected to 4-year terms. The members of the legislature are elected by direct and secret ballot from among the candidates approved by the Council of Guardians. In 1988, Ayatollah Khomeini created the Council for Expediency, which resolves legislative issues on which the Majles and the Council of Guardians fail to reach an agreement. Since 1989, it has been used to advise the national religious leader on matters of national policy as well. It is composed of the president, the speaker of the Majles, the judiciary chief, the clerical members of the Council of Guardians, and other members appointed by the Supreme Leader for 3-year terms. Cabinet members and Majles committee chairs also serve as temporary members when issues under their jurisdictions are considered. In 2005, it was announced that the Expediency Council, which now has over 40 members, would have responsibility for general supervision of the system, though that has not resulted in any noticeable change in this institution's day-to-day authority or operations. Judicial authority is constitutionally vested in the Supreme Court and the four-member High Council of the Judiciary; these are two separate groups with overlapping responsibilities and have one head. Together, they are responsible for supervising the enforcement of all laws and for establishing judicial and legal policies. Iran has two military forces. The national military is charged with defending Iran's borders, while the Islamic Revolutionary Guard Corps (IRGC) is charged mainly with maintaining internal security. Iran has 30 provinces managed by an appointed governor general. The provinces are further divided into counties, districts, and villages. Sixty percent of eligible voters took part in the first ever municipal and local council elections in 1999, though a lower percentage went to the polls in the second round in 2003. Turnout during the December 15, 2006 elections, during which citizens also elected Assembly of Expert representatives, was over 60%. The local councils select mayors. The March 2008 elections resulted in the conservatives getting a significant lead in the polls, with Conservative politician Shahabeddin Sadr saying that, during early counting, 70 per cent of winners were "principlists" - a label conservatives use to describe their loyalty to the Islamic Republic's ideals. Iran's post-revolution difficulties have included an 8-year war with Iraq, internal political struggles and unrest, and economic disorder. The early days of the regime were characterized by severe human rights violations and political turmoil, including the seizure of the U.S. Embassy compound and its occupants on 4 November 1979, by Iranian student militants. Iranian authorities released the 52 hostages only after 444 days of captivity. By mid-1982, the clergy had won a succession of post-Revolution power struggles that eliminated first the center of the political spectrum and then the leftists, including the communist Tudeh party and the cult-like Mujahedin-e Khalq Organization (MEK or MKO). Assassinations, throwing acid in the faces of women who refused to wear the veil, and other acts of violence punctuated this period. There has been some moderation of excesses since the early days of the revolution, and the country experienced a partial "thaw" in terms of political and social freedoms during the tenure of former president Khatami, but serious problems remained. The administration of former President Ahmadi-Nejad had witnessed a crackdown on Iranian civil society, continued human rights violations, and worsening constraints on press freedom and civil liberties. Current president Hassan Rouhani did not changed anything. The Islamic Republican Party (IRP) was Iran's sole political party until its dissolution in 1987. Iran now has a variety of groups engaged in political activity; some are oriented along ideological lines or based on an identity group, others are more akin to professional political parties seeking members and recommending candidates for office. Some have been active participants in the Revolution's political life while others reject the state. Conservatives consistently thwarted the efforts of reformists during the Khatami era and have consolidated their control on power since the flawed elections for the seventh Majles in 2004 and president Ahmadi-Nejad's victory in 2005. The party of Khamenei is the Combatant Clergy Association. President Hassan Rouhani is a member of it. The Iranian Government has faced armed opposition from a number of groups, including the MEK (which the U.S. Government added to its list of Foreign Terrorist Organizations in 1999), the People's Fedayeen, and the Kurdish Democratic Party of Iran (KDPI). Khomeini's revolutionary regime initiated sharp changes from the foreign policy pursued by the Shah, particularly in reversing the country's orientation toward the West. In the Middle East, Iran's only significant ally has been Syria, but Iran has made strides in improving relations with its Gulf neighbors, particularly Saudi Arabia. Iran's foreign relations are based on sometimes competing objectives. Iran's pragmatic foreign policy goals include, not surprisingly, protecting itself from external threats and building trade ties. Iran has additionally been accused, however, of trying to export its fundamentalist revolution to other countries, sometimes supporting terrorist organizations, and its vehement anti-U.S. and anti-Israel stances are well-known. Senior Iranian officials directed Hezbollah to carry out the bombing of the Asociación Mutual Israelita Argentina (AMIA, the Argentine Israelite Mutual Association) building in Buenos Aires on July 18, 1994, killing 85 people and wounding scores of others. Out of the eight individuals indicted by the Government of Argentina in October 2006, the Interpol Executive Committee has recommended the issuance of Red Notices (international arrest warrants) against six: five former or current Iranian officials and one Lebanese Hezbollah leader. In September 1980, during the U.S. hostage crisis, Iraq invaded Iran to take control of the waterway between the two countries, the Shatt al-Arab, although the conflict's underlying causes included each nation's overt desire for the overthrow of the other's government. Iran defended itself and demanded the withdrawal of Iraqi troops from Iranian territory and the return to the status quo ante for the Shatt al-Arab as established under the 1975 Algiers Agreement signed by Iraq and Iran. Khomeini's government turned down an Iraqi cease-fire proposal in 1982, making a new demand for Saddam Hussein's removal as well. After eight punishing years of war, in July 1988, Iran at last agreed to UN Security Council Resolution 598 and the cease-fire was implemented on August 20, 1988. Neither nation had made any real gains in the war. Hugo Chavez and former president Ahmadineyad. Iran's relations with many of its Arab neighbors have been strained by Iranian attempts to spread its Islamic revolution, a strictly ideological goal. In 1981, Iran supported a plot to overthrow the Bahrain Government. In 1983, Iran expressed support for Shi'ites who bombed Western embassies in Kuwait, and in 1987, Iranian pilgrims rioted during the hajj (pilgrimage) in Mecca, Saudi Arabia. Nations with strong fundamentalist movements, such as Egypt and Algeria, also mistrust Iran. Iran backs Hezbollah (in Lebanon), Hamas, Palestinian Islamic Jihad, and the Popular Front for the Liberation of Palestine-General Command, all of which are violently opposed to the Arab-Israeli peace process. In contrast, while relations with west European nations have been uneven, they have been driven primarily by pragmatic goals of trade and security. Iran has accepted stronger commercial ties but largely declined to deliver on key European political concerns such as human rights and weapons of mass destruction (WMD) acquisition efforts, particularly in the nuclear field, where the International Atomic Energy Agency (IAEA) has been strongly critical of Iran. An IAEA report in November 2003 provided evidence that Iran, a signatory to the Nuclear Non-Proliferation Treaty (NPT), had concealed secret nuclear activities for 18 years. Under international pressure, Iran signed the Additional Protocol to the Safeguards Agreement on December 18, 2003, agreeing to suspend all uranium-enrichment and reprocessing activities voluntarily, as well as cooperate fully with the International Atomic Energy Agency (IAEA) in resolving questions regarding Iran's nuclear program. In June 2004, the IAEA rebuked Iran for failing to fully cooperate with an inquiry into its nuclear activities, and in November 2004, Iran agreed to suspend most of its uranium enrichment under a deal with the EU. That promise did not last, however, and since then concerns over Iran's nuclear activities have increased. On June 6, 2006, China, France, Germany, Russia, the United States, and United Kingdom offered Iran a substantial package of economic cooperation and assistance. Tehran, however, was first required to come into compliance with International Atomic Energy Agency (IAEA) guidelines on its nuclear program, suspending its uranium enrichment program. On July 31, the UN Security Council adopted resolution 1696 on the Iranian nuclear question, requiring Iran to suspend all activities related to enrichment and reprocessing, including research and development, as demanded by the IAEA, or else face possible sanctions. Tehran defied the UN Security Council (UNSC) deadline of August 31, leading to the passage of UNSC Resolution 1636 in December 2006 and, as Iran continued to balk, Resolution 1747 in March 2007. Iran sparked an international controversy when its forces seized and held hostage 15 British sailors and marines, conducting routine anti-smuggling operations in Iraqi territorial waters under UN mandate, on March 23, 2007. Tehran released the U.K. service members on April 6. Iran maintains regular diplomatic and commercial relations with Russia and the former Soviet republics. Both Iran and Russia believe they have important national interests at stake in developments in Central Asia and the Transcaucasus, particularly regarding energy resources from the Caspian Sea. Russian and other sales of military equipment and technology to Iran concern Iran's neighbors and the United States. Washington is also concerned about Russian assistance in building at nuclear facility at Bushehr. Iran spends about 3.3% of its GDP on its military. Iran's military consists of both a national military held over from the shah's government and the IRGC, each with its own ground, naval and air branches. The Iran-Iraq war took a heavy toll on these military forces. Iran is trying to modernize its military, including ballistic missile programs, and acquire weapons of mass destruction; it continues to seek nuclear capabilities. On November 7, 2007, Ahmadinejad announced that Iran had 3,000 centrifuges operating in its uranium enrichment program, which would be enough to produce a nuclear weapon. However, a December, 2007 U.S. intelligence report stated that Iran halted its nuclear program in 2003, and remains on hold. According to the National Intelligence Estimate, "We do not know whether (Iran) currently intends to develop nuclear weapons." The Iranian government supports and funds Islamic terrorist organizations in various countries, doing so since the Islamic revolution in 1979. The U.S. Department of State labels Iran as a leading state sponsor of terror. On November 4, 1979, militant Iranian students occupied the American Embassy in Tehran with the support of Ayatollah Khomeini. Fifty-two Americans were held hostage for 444 days. On April 7, 1980, the United States broke diplomatic relations with Iran, and on April 24, 1981, the Swiss Government assumed representation of U.S. interests in Tehran. Iranian interests in the United States are represented by the Government of Pakistan. The Islamic Republic of Iran does not have its own embassy in Washington, though it does have a permanent mission to the United Nations in New York City. In accordance with the Algiers declaration of January 20, 1981, the Iran-U.S. Claims Tribunal (located in The Hague, Netherlands) was established for the purpose of handling claims of U.S. nationals against Iran and of Iranian nationals against the United States. U.S. contact with Iran through The Hague covers only legal matters. The U.S. Government, by Executive Orders issued by the President as well as by Congressional legislation, prohibits most trade with Iran. Some sanctions were imposed on Iran because Tehran is a state sponsor of terrorism, others because of the nuclear proliferation issues, and still more for human rights violations, including infringement of religious freedom. The commercial relations that do exist between the two countries consist mainly of Iranian purchases of food and medical products and U.S. imports of carpets and food. Some sanctions were temporarily waived in the wake of the devastating Bam earthquake of December 2003. U.S. officials and relief workers actively assisted in relief and reconstruction efforts. There are serious obstacles to improved relations between the two countries. As a state sponsor of terrorism, Iran remains an impediment to international efforts to locate and prosecute terrorists. Recent attempts by Iran to form loose alliances with anti-U.S. governments in the Western Hemisphere, such as the Venezuelan Government, has further heightened concern about Iran's support for terrorism and nuclear ambitions. Operation Iraqi Freedom removed the Iranian Government's greatest security threat, but officially Iran remained neutral about U.S. policy, sometimes strongly condemning American policies and actions in Iraq. Iran has cultural ties to elements of the populations of both Iraq and Afghanistan. It has made some positive contributions to stability in both countries, but other actions have had the opposite effect. It remains to be seen whether Tehran will ultimately be a constructive force in the reconstruction of its two neighbors or not. Its dismal human rights record and lack of respect for its own people. The United States has held discussions with Iranian representatives on particular issues of concern over the years. U.S. and Iranian envoys cooperated during operations to overthrow the Taliban in 2001 and during the Bonn Conference in 2002 that established a broad-based government for the Afghan people under President Karzai. The Secretary of State, her Iranian counterpart, and others met at talks on Iraq in Sharm El Sheikh, Egypt, on May 3, 2007. The American and Iranian ambassadors to Iraq took part in face-to-face discussions in Baghdad, with Iraqi officials in attendance, on May 28, 2007. The United States believes, however, that normal relations are impossible until Iran's policies change. Nevertheless, the U.S. State Department is supporting efforts to further the cause of democracy in Iran. In fiscal year (FY) 2006, the U.S. Congress allocated approximately $66 million to promote free media, personal freedom, and a better understanding of western values and culture. As part of these efforts, the Department supports efforts to develop civil society in Iran and exchange programs that bring Iranian students, athletes, professionals and others to the United States. The Secretary of State has stated that Iranian agreement to abide by UNSC Resolutions 1696 and 1747, calling for Tehran to suspend uranium enrichment and comply with its international nuclear obligations, could lead to the direct negotiations between American and Iranian government officials, not only on Iran's nuclear case but on a wide range of issues. In May 2007, the Iranian Government charged and in some cases imprisoned a handful of innocent Iranian-American scholars, civil society actors, and journalists, accused by the regime of jeopardizing the security of the state. The international community, academic institutions, non-governmental organizations (NGOs) and private citizens have joined the U.S. Government in calling for the release of the detained dual nationals, as well as Iranian cooperation in the case of missing retired FBI agent Robert Levinson, last reported on Kish Island, Iran, on March 8, 2007. Beginning in 2004, U.S. President George W. Bush is reported to have signed a series of Executive Orders initiating covert operations aimed at destabilizing the Iranian regime. The CIA was authorized to supply communications equipment which would enable opposition groups in Iran to work together and bypass internet censorship by the government. During the domestic unrest following the post-election protests in which opposition groups accused the regime of rigged elections, U.S. Secretary of State Hillary Clinton urged Twitter networking service to keep the system running, leading to complaints from Iran's government. Protesters used Twitter to communicate amid the clampdown. Pre-revolutionary Iran's economic development was rapid. Traditionally an agricultural society, by the 1970s Iran had achieved significant industrialization and economic modernization. However, the pace of growth had slowed dramatically by 1978, just before the Islamic revolution. Since the fall of the shah, economic recovery has proven elusive thanks to a combination of factors, including fluctuations in the global energy market. Economic activity was severely disrupted additionally by years of upheaval and uncertainty surrounding the revolution and the introduction of statist economic policies. These conditions were worsened by the war with Iraq and the decline in world oil prices beginning in late 1985. After the war with Iraq ended, the situation began to improve: Iran's GDP grew for two years running, partly from an oil windfall in 1990, and there was a substantial increase in imports. However, Iran had suffered a brain drain throughout the previous decade and wartime policies had resulted in a demographic explosion. A decrease in oil revenues in 1991 and growing external debt dampened optimism for recovery. In March 1989, the government instituted a new 5-year plan for economic development, which loosened state control and allowed Iran to seek greater latitude in accessing foreign capital. Mismanagement and inefficient bureaucracy, as well as political and ideological infighting, hampered the formulation and execution of a consolidated economic policy, and the Iran fell short of the plan's goals while economic inequality was aggravated. Today, Iran's economy is a mixture of central planning, state ownership of oil and other large enterprises, village agriculture, and small-scale private trading and service ventures. Former President Khatami followed the market reform plans of his predecessor, President Rafsanjani, and indicated that he would pursue diversification of Iran's oil-reliant economy, although he made little progress toward that goal. High inflation and expansive public transfer programs, as well as powerful economic-political vested interests created obstacles for rapid reform. During the 2005 election campaign, President Ahmadi-Nejad promised to redistribute oil revenues to the impoverished, fund large infrastructure projects, and privatize Iranian state enterprises. He has been criticized within Iran for not carrying through on many of his promises. While establishment of the Imam Reza fund for cheap loans to youth has been popular, a law increasing the minimum was revoked because of the huge strain on employers. The "Shares of Justice" program—distributing shares of state-owned enterprises to the poor—faces a number of potential problems. Although Islam guarantees the right to private ownership, banks and some industries—including the petroleum, transportation, utilities, and mining sectors—were nationalized after the revolution under Marxist-influenced economic policies. Starting under President Rafsanjani, Iran has pursued some privatization through its nascent equities markets. However, the industrial sector remains plagued by low labor productivity and shortages of raw materials and spare parts, and is uncompetitive against foreign imports. Increases in the price of oil starting in 2003 have increased state revenue enormously and permitted a much larger degree of spending on social programs than previously anticipated. However, this has not eased economic hardships such as high unemployment and inflation. The proportion of the economy devoted to the development of weapons of mass destruction and military spending overall remains a contentious issue with leading Western nations. GDP (purchasing power parity, 2006 est. ): $599.2 billion. GDP (official exchange rate, 2006 est. ): $193.5 billion. GDP real growth rate (2007 est. ): 4.6%. GDP composition by sector (2006): Agriculture 11.2%, industry 41.7%, services 47.1%. Per capita income (2006 est. ): $8,700. Work force - by occupation (2001 est. ): Agriculture 30%, industry 25%, services 45%. Unemployment rate (2007 est. ): 20%. Natural resources: Petroleum, natural gas, coal, chromium, copper, iron ore, lead manganese, zinc, sulfur. Agriculture: Principal products—wheat, rice, other grains, sugar beets, fruits, nuts, cotton, dairy products, wool, caviar. Note: Iran is not self-sufficient in terms of food. Industry: Types—petroleum, petrochemicals, textiles, cement and building materials, food processing (particularly sugar refining and vegetable oil production), metal fabricating (particularly steel and copper), armaments. Trade (2007 est. ): Exports--$56.9 billion: petroleum 80%, chemical and petrochemical products, carpets, fruits, nuts. Major export partners (2006): Japan (17.3%), China (11.4%), Italy (6.2%), South Korea (5.2%), South Africa (5.5%), Turkey (5.7%), Netherlands (4.6%), France (4.1%), Taiwan (4.1%). Imports--$48.1 billion: industrial raw materials and intermediate goods, capital goods, foodstuffs and other consumer goods, technical services, military supplies. Major import partners: Germany (14.2%), U.A.E. (6.7%), China (8.3%), Italy (7.5%), France (6.2%), South Korea (5.4%), Russia (4.9%). Iran currently relies upon her Russian and Chinese allies to supply defense equipment. In addition, it holds sizable stockpiles given to it by the United States during the period of the Shah. Tensions between Iran and the United States have increased since Iran was identified by President Bush in January 2002 as part of the Axis of Evil, and particularly since the 2005 election of Ahmadinejad. An attempt by the European Union to negotiate a surrender of or reduction in Iranian nuclear efforts failed, leading to the United Nations Security Council voting to impose limited sanctions. The United States has since lobbied for sanctions more along the lines of those imposed on 1990 upon Iraq, which remained in place until the beginning of Operation Iraqi Freedom in 2003. Talks in March 2007 between U. S., Iranian, and Syrian diplomats at a regional conference organized by Iraq proved unproductive, although the willingness of the parties to talk was itself regarded by some as a sign that war had become somewhat less likely. In spite of the relative overstretch of the U. S. military, the utility of an attack on Iran, or at least its nuclear facilities, was a live debate among American opinion leaders throughout 2006. Objections to such an attack were mostly based upon the belief that this would represent the first step on a slippery slope to occupation of Iran, which would probably require conscription in the United States, a step conservatives and most military leaders oppose. The debate, however, appeared to have been won decisively by the hawks following the regime's suicidal decision in late March 2007 not to promptly release 15 British sailors and marines it had captured on March 23, 2007. In 2007, NATO officials caught Iran "red-handed" shipping heavy arms, C4 explosives and advanced roadside bombs to the Taliban for use against NATO forces. The NATO officials stated that the incident was a "dramatic escalation of Iran's proxy war against the United States and United Kingdom". A United States intelligence report in 2007 noted growing public unrest in Iran over the bleak economic situation. An Achaemenian Soldier by Iman Maleki. Homosexuals get the death penalty in Iran. However, in a speech at Columbia University, the president of Iran stated that homosexuality does not exist in his nation. In Iran, production and consumption of alcohol by Muslims is prohibited. However, Iranian law makes an exception for minority groups, such as the Christian Armenians, who are allowed to produce and consume wine and distilled spirits. Naturally, these communities produce far more alcohol than they consume, "illegally" selling it to Muslims who drink in contradiction of Sharia law. Prostitution is also prohibited in Iran, but there are allegations that نكاح المتعة (temporary marriage, legal in Usuli Shia jurisprudence) is exploited to solemnize marriages of such short duration (hours or days) that the activities thus permitted more resemble dating (if money is not exchanged) or prostitution (if a fee is charged for the marriage). Iran: Western Spy Networks Discovered, May 26, 2007. Iranian-American charged with spying, May 29, 2007. Articles about Iran from previous "Breaking News"
Big government Welfare state leads to socialist Nanny state, leads to communist Police state - Don't think Communism is incompatible with Islam. Iran leader calls for alliance against West. ↑ Nazarian, Adelle (October 13, 2017). A Brief Timeline of Iran-Sponsored Terrorism Since 1979. Breitbart News. Retrieved October 13, 2017. ↑ Lee, Matthew (July 19, 2017). Iran still top state sponsor of terrorism, U.S. report says. PBS (from the Associated Press). Retrieved October 13, 2017. ↑ Reports Suggest Obama Faces Early Choice On Iran Covert Ops, Ron Synovitz, Globalsecurity.org January 13, 2009. ↑ Bush sanctions 'black ops' against Iran, London Telegraph, 27 May 2007. ↑ Hillary Clinton defends Twitter efforts for Iran, L.A. Times, June 17, 2009. ↑ Iran Caught Red-Handed Shipping Arms to Taliban. June 8, 2007. Assyrian International News Agency. ↑ Document: Iran Caught Red-Handed Shipping Arms to Taliban. June 6, 2007. ABC News. ↑ http://news.yahoo.com/s/ap/20070824/ap_on_go_ot/us_iran;_ylt=AqDn5RrWdeIow5YjHjscMn2yFz4D Draft report logs bleak outlook for Iran. August 24, 2007. Associated Press. This page has been accessed 81,946 times.